As some of you may know, Ravelry is looking to hire a new Email Fairy. It's part-time, off-site, and perfect for me! I mean, come on, it's Ravelry! And I need something to do! Besides, we Virgos like to be helpful. So, if you know Jess, Casey, and/or MH, please put in a good word for me. Mwah! Yesterday Nick gave me a parenting reprieve for the afternoon so I could attend a shawl knitting class with Joan Schrouder at Knitty City. Yes, THE Joan Schrouder (I always think of the bandito Juan in Romancing the Stone who says "Joan Wilder? Zee Joan Wilder?"). 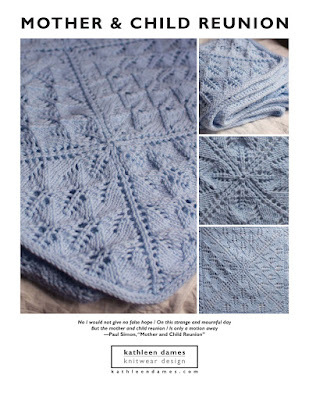 The guru of the Knitlist, designer of the Lotus Blossom Lace shawl on the cover of Shawls and Scarves: The Best of Knitter's Magazine, and general all-around clever lady. Of course, I forgot to bring my camera (blame it on sleep-deprivation, Penelope seems to have gotten a variant of my last cold) but had a really nice time. It was all about triangular and trapezoidal shawls. Really fun to get a more thorough grasp on the different construction options, rates of increase, top-down vs. bottom-up, etc. And I learned how to do a long-tail cast-on without a slip knot. Clever and useful bit of knowledge. a vest-y thing for my sister that I'm designing as I go with one skein of Romney Ridge Farm Hand-dyed yarn (64% wool, 36% mohair) - I'm kind of stuck up at the top: bustier? halter? cami? Tempest by Ann Weaver in "Impressionist Sky" Malabrigo sock yarn - delicious yarn - at the making up part where I've discovered that, despite all my careful hash marks, I seem to have not knit the same number of rows for the fronts as for the backs. Very odd, as I knit each piece separately, not both fronts at the same time. I think I may sew up the side seams from the top-down and then snip and frog the longer portion and bind off the bottom. Sigh. You probably want pictures. I don't show many WIP pics these days, but maybe I'll snap some soon, since there aren't any exciting FOs to show. But Isobel's shrug will probably be ready soon - nothing like a little time with a well-written pattern and some worsted-weight yarn when your own theoretical projects (and ones knit in sock yarn) aren't cooperating.